Review: If Leslie Knope and Ron Swanson of Parks and Recreation came up with their own reality competition show, it would look a lot like Making It. 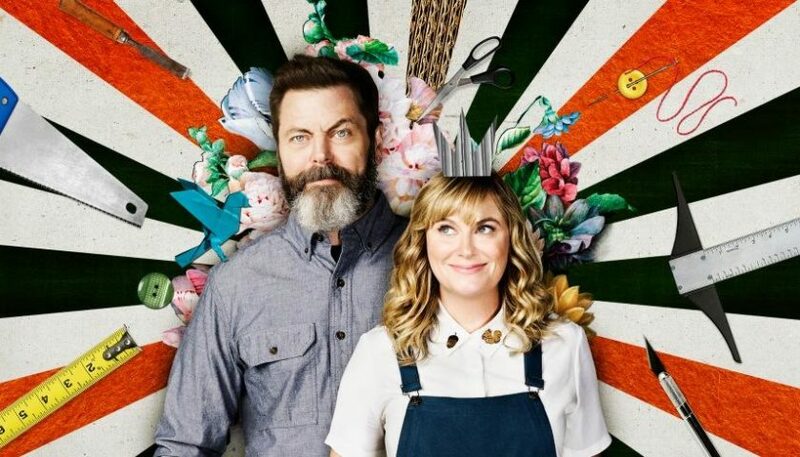 Which makes sense since Amy Poehler and Nick Offerman, the actors who famously played Leslie and Ron on the NBC comedy, are the executive producers and hosts of Making It, a new NBC series in which American crafters strive to create clever, beautiful, and practical handmade pieces of art. “Life is stressful enough,” Poehler says in the introduction to the first episode, which premieres Tuesday night. “Let’s make a show that makes you feel good.” Making It is definitely that, and definitely Knope-ish in that intent. There’s no doubt that Pawnee’s finest citizen would appreciate the can-do spirit and cleverness possessed by the eight contestants, each of whom claims a different specialty (such as felt work, interior design, paper), while Indiana’s finest libertarian handyman would love their strong work ethic and the show’s forays into woodworking. As an actual woodworker himself, Offerman also brings a valuable understanding and knowledge of craftsmanship to the show, in addition to the chemistry he shares with his longtime co-star. With all due respect to the wonderful Nicole Byer and Jacques Torres of Netflix’s Nailed It!, Poehler and Offerman now hold the title of best reality-show co-hosting duo on television. Most notably, the format and the sense of decency that beams out from Making It like a lit bulb inside a handcrafted lamp comprised of natural elements — an actual Making It challenge! — are very much in keeping with the vibe of The Great British Baking Show. They’re so close in sensibility that the coveted title on Making It only differs from the one on the PBS series by a single letter: This time, the goal is to become master maker, as opposed to master baker. Basically, Making It is the TV equivalent of something a contestant on Making It would produce: a new, signature piece, sculpted out of bits recycled in an imaginative way. Here’s how the show works: Eight contenders from various parts of the country gather in a massive barn on a bucolic farm where, in each episode, they must complete two challenges. The first is a “Faster Craft,” a smaller-scale project that can be completed relatively quickly (a terrarium or a Halloween costume), and the second is a “Master Craft,” a grander, more complicated endeavor, like a child’s play fort or a tricked-out shed. Every week, patches are given to the winners of each challenge and one person is sent home until, eventually, it’s down to the final three. Ultimately, a Master Maker will be crowned and given a reward of $100,000 in the sixth and final week. But the real reward is, of course, the artistic process and getting to hang out with Poehler and Offerman, who drop by every workstation to ask questions, offer help, and do some improv comedy. In analogy terms, Amy and Nick are to Making It as Mel and Sue were to The Great British Baking Show, except that they’re even more involved. That’s a good thing because they amp up the show’s charm enormously. They seem sincerely interested in the contestants’ thought processes and backgrounds, and also do exactly the kinds of things you would hope Amy Poehler and Nick Offerman would do if they showed up at your workshop clad in overalls and flannel. Poehler goes off on random, hilarious riffs, including one related to the popularity of the pool noodle as a crafting tool. “Pool Noodles, please hold! Pool Noodles, please hold!” she chirps, panic-stricken, as if she’s responsible for answering the phone at Pool Noodle headquarters. By the way, the fact that pool noodles are a running reference in Making It is, to me, yet another piece of strong evidence that this show is great. Every show would be ten times better if more of the characters talked about pool noodles every once in a while. Then there are the pun-offs, the back-and-forths in which Poehler and Offerman attempt to outdo each other in lightning rounds of crafting-related puns. During a “celebrity edition” of this regular feature, they rattle off a stream of reimagined famous names, including Seth Plyers, Michael Felts, and Matthew McConaug-clay. It is nothing short of delightful, and it also gives The Good Place a run for its money as punniest show on television. In a more meaningful sense, what’s delightful is the generosity and kindness that the contestants show toward one another. Not only are they congratulatory and supportive, but they actually help each other, sharing materials and sometimes even setting their own projects aside to help a barn-mate who’s struggling. I never thought I’d say this, but the contestants on Making It may be even nicer to each other than — clutches pearls — the ones on The Great British Baking Show. At a time when Americans are living in the alleged aftermath of the death of civility, it is so affirming and pleasant to watch people looking out for each other like this. You can actually watch Making It with your kids and tell them that this is how grown-ups behave, without having to sound sarcastic. With Making It, Poehler and Offerman haven’t just given us another reality program. They’ve conjured a tiny oasis in our combative culture, and a glue-gun-ready glimmer of how society should (and sometimes still does) function. In other words, as promised, they’ve made a show that makes you feel good. If for some reason you’re still not sure whether to watch or not, I’ll leave you with a final piece of Parks and Recreation–style advice: Go ahead, treat yo self.